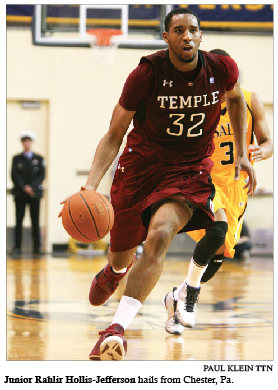 The Owls will rely on the junior forward to pick up the offense. In the city of Chester, Pa., basketball is a way of life. From the early development on the playgrounds and in the Biddy League on the hardwood, the game becomes ingrained into a player and stays forever. Chester has garnered a reputation for developing professional talent, such as Orlando Magic point guard Jameer Nelson and Sacramento Kings guard Tyreke Evans of the National Basketball Association. Owls’ junior forward Rahlir Hollis-Jefferson shares their Chester roots. Between his junior and senior years at Chester, Hollis-Jefferson went from a role player to the leader of a program that is woven into the Pennsylvania history books. “In high school, we had a senior-driven team where we had at least three or four other scorers and all I had to do was play defense and score sometimes, whereas once I became a senior, I had the ball more and I had to make more decisions,” Hollis-Jefferson said. With three of the starting five set to graduate from a Temple squad that was nationally ranked in the regular season, Hollis-Jefferson will be called on to do exactly that: become one of the leaders for the Owls next year. Along with teammates Khalif Wyatt, Scootie Randall and T.J. DiLeo all returning for their senior seasons as well, Hollis-Jefferson said the Owls will still have enough scoring power. Last season Hollis-Jefferson averaged 9.3 points and 6.6 rebounds per game as a regular in the starting lineup and contributed as a facilitator for guards Ramone Moore and Juan Fernandez. Dunphy said he hopes to see a transformation in the 6-foot 6-inch junior during the offseason. In the Atlantic Ten Conference tournament, the Owls were bounced in the first round by Massachusetts, then also suffered the same fate in the big dance when South Florida used a stifling defense to send Temple back home after a stellar regular season. With that in the rear view mirror, Hollis-Jefferson said he feels he needs to work on some things in the gym during the offseason to kick his game into another gear. Hollis-Jefferson’s brother, Rondae Jefferson, is a junior who is coming off leading the Chester Clippers to an undefeated season and the PIAA state championship. Hollis-Jefferson’s brother is already generating interest from many Division I schools, including Temple. The brothers are about the same size, but Hollis-Jefferson acknowledges there may be more differences than similarities. Hollis-Jefferson and company hope to lead the Owls to its fifth-consecutive NCAA tournament berth in the final season as a member of the A-10. Dunphy said Hollis-Jefferson has the experience and leadership to guide the rest of the squad and make the decisions in critical moments of a game. While Hollis-Jefferson may not be the most talkative player and steers away from the spotlight as much as he can, he lets his play on the court speak for itself. Dunphy said he expects good things to come with Hollis-Jefferson taking on more responsibility. Bud Weaver can be reached at bud.weaver@temple.edu. Senior forward Rahlir Hollis-Jefferson scores 20 as Owls move to 7-1. Owls face toughest tests against Villanova and Duke this week.